Runstreet returns to Bean Town for the Boston Shakeout Art Run, presented by Clif Bar. See incredible Boston street art on this relaxed pace running adventure the day before the Boston Marathon. Whether you're getting in a shakeout before race day or in town to cheer, all are welcome for an afternoon of art, fitness, and fun! The 3.5-mile fun run will be at a relaxed, 10-minute mile pace, with stops for photos along the way. Each runner gets a special edition Boston Shakeout Art Run shirt designed by local street artist legend Cedric Douglas. Runstreet photographer Marques Jackson will be capturing all the colorful fun with professional photos that everyone will receive access to after the event. Use hashtag #BostonShakeoutArtRun on all social posts to be eligible for our photo contest raffle! There will be a bag check available. 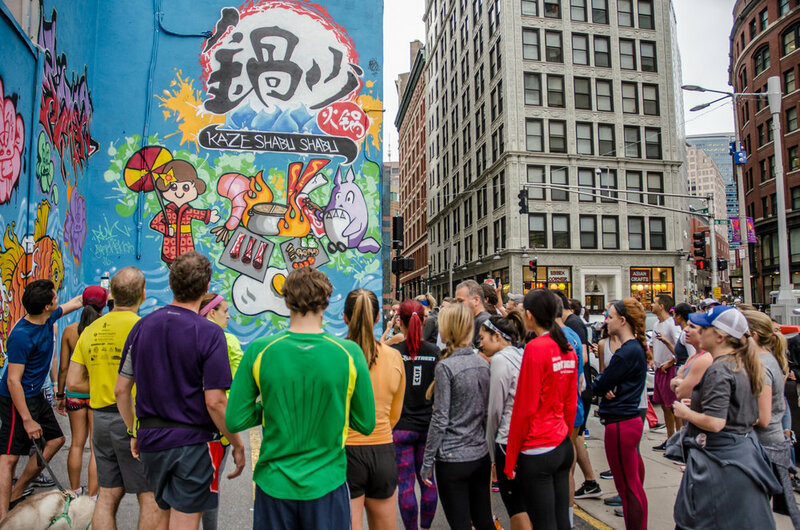 You won't want to miss this amazing run to see Boston's most beautiful street art! Be prepared to pull your ticket up on your phone. All ages of runners welcome. All you need are comfortable running shoes! And a phone to snap photos! Bag drop will be provided. There will be no refunds. Participants who cannot attend will receive credit toward a future Art Run. In the event of extreme weather, the run will be rescheduled.